And it isn't adding up. I was attempting to work the new mini sampler's colors on to a piece of raw Belfast. Looked bigger than it should for 32 count. So I measured. 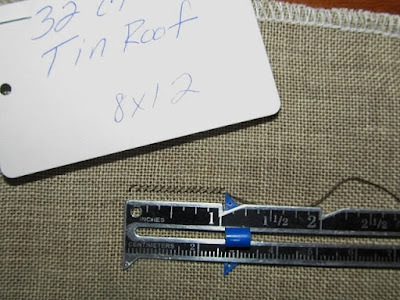 It's marked Belfast 32 but it is not because my work came to 15 stitches per inch or 30 count. Does it matter? If it didn't, we wouldn't have the option of 28, 30, and 32 counts offered. On a small piece even a half inch makes a difference so yes, to me, it does. I took a piece of Tin Roof in 32 count for testing, and it was worse that the Belfast. It's 28 count. Looking at the 30 count, I can see it is tighter than the 32, which is really 28, so the 30 is probably correct. Follow me? But both the Belfast and Tin Roof 32 count pieces are not. I wanted to use 35 to keep it very small but I have no unbleached or darker neutrals, and do not want to start messing with the dye jars. I'll do a more thorough search through the mess for 35s. When you are slumping along and not feeling the needle love, all it takes is a little bump in a road to make you ride away. But I will try to keep the pedal to the metal. I was hoping to have something worked out last night because today I have to spray the weeds and grass around Carole's house before the landscapers come. All that trigger work will most likely make the finger worse, but if I eat a Breyer's low carb fudge bar, I will have a stick to tape on for support. A damn good means to an end don't 'ya think? Love your logic Marly. Enjoy the fudge bar! Oh so that is how you figure out what count that odd piece is. Always wondered. we MUST do to make do, alas. once did.. Love your tenacity. 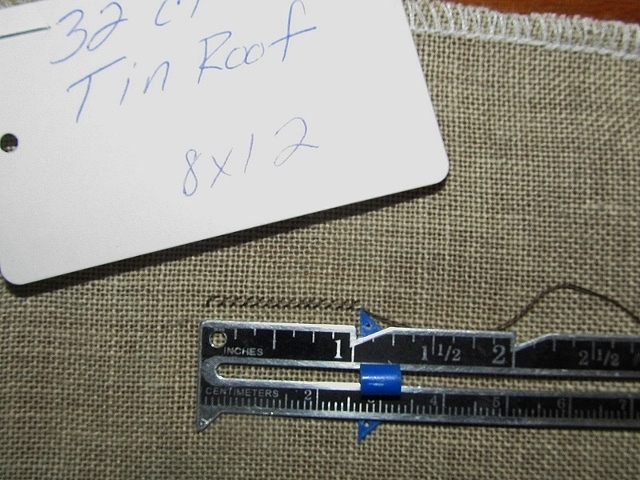 I have had the same problem with I order linen from 123Stitch. But they were very good about replacing it. Enjoy the fudge and then enjoy your stitching later! The stick from the Breyers fudge bar sounds like a plan to me. Would love to see pictures of the landscaping venture. 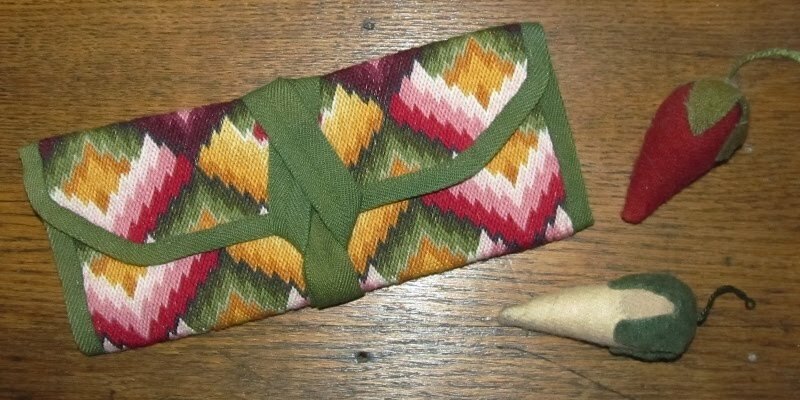 I was stitching on evenweave the other day. You would think that if you stitched 5 stitches by 5 stitches it would be a square-but no it was a rectangle!!! I wonder if this happens all the time and I never noticed because unless you are stitching a square it wouldn't be too obvious. Hope you feel better. This is interesting...I always take the package or tag for granted that it is correct. I will have to re-think that now. Fascinating. Completely frustrating, but fascinating. Guess what this tells me is that the only linens in the stash tub that I can be sure of are the pieces that were mysteries when purchased and which I counted myself. What a great reason to go for a fudge bar!!! After all, you have to take care of that hand! I always count the stitches from the chart on my linen so I know if the finished embroidery will fit and it is what I wanted in lenght. Take care and eat the bar before your work at Carole's. Good grief, Marly. You may have a sore finger but your eyes must be like a 12 year old's! When counting do you alwsys count over 2, the multiply? I have some mystery fabric and would like to figure it out. Thank you for your blog, it is always fun and informative. 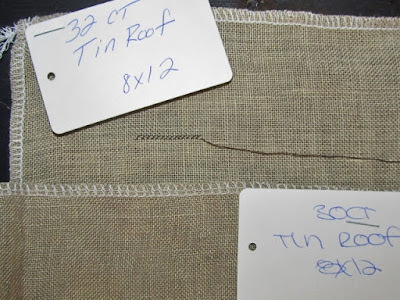 I just purchased some Tin Roof for a small project. Now I'm skeptical, and will be counting EVERY piece of linen I have. I always trusted that the sellers were correct. May I ask where you found that sweet little ruler? I think I need one just like that! Hope the fudge bar did the trick! !